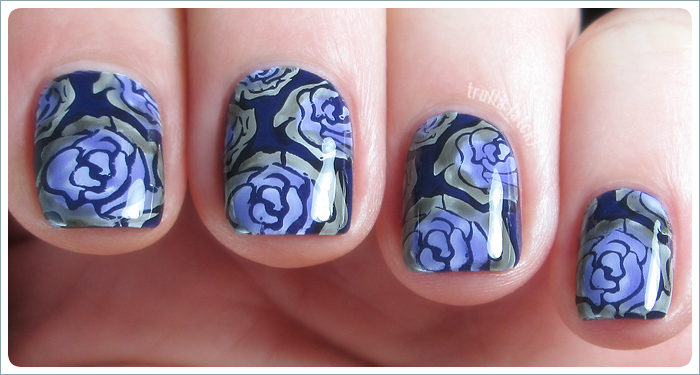 I started with two coats of a dark blue, added the white stamping and then a layer of top coat. After this was dry, I mixed some black and the blue polish with clear polish and roughly shaded the roses. I thought about adding some glitter, but then decided against it (unbelievable, right? *g*) and simply finished it off with another layer of top coat. If you look closely, the stamping on the ring and little finger looks a bit more soft, right? This was once again one of those happy accidents: I had to clean the plate between middle and ring finger, and I didn’t rub the plate completely dry afterwards. So it was still slightly damp with polish remover, which thinned down the stamping polish and caused that smooth look. I tried it again on purpose on the little finger and it worked like a charm. It might not be a good idea for patterns with thin, crisp lines, but for larger patterns like this I will have to keep it in mind, I really like how soft and somewhat blurry it looks. The downside is of course, that the original white pattern was already a bit shaded and not 100% opaque as usual – but in this case it didn’t matter. 31. Mar. 2015 in Mottomonat-2015, Stamping. Ui, dank mir war das?? Wow! Da muss ich mir glatt selber gratulieren, wenn du dadurch auf dieses unglaublich schöne Design gekommen bist! ❤ Ich liebe diesen Look.